In my last blog I talked about the event we held to support DVLA’s Code Club initiative. We’re keen to develop the next generation of technical talent in the local area to support the local economy and ensure that the right skills exist for DVLA to draw upon in future. 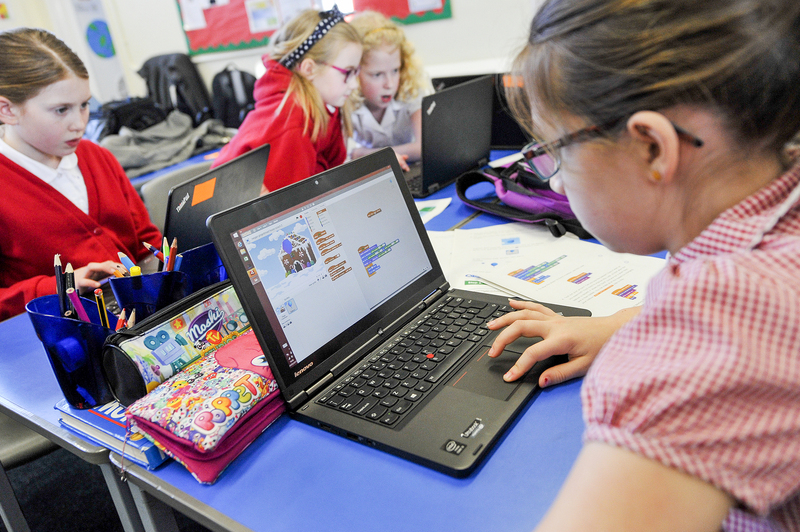 The event held in conjunction with Code Club and Stemnet was to encourage local primaries to sign up to host Code Clubs and for local authorities and businesses to support the initiative. We kept the event as informal as possible to avoid a day of death by PowerPoint. To get buy-in we showcased how Code Club worked in schools already signed up by inviting 3 schools to bring their pupils along. We had 50 primary school children and teachers all running their normal after school coding clubs, with more than 60 interested representatives from schools, businesses, councils, new volunteers and DVLA volunteers all getting involved. The school sessions were fully interactive. Our biggest problem on the day was getting everyone to stop for lunch. Swansea City Council leader Rob Stewart also attended. The council fully supports this initiative recognising that digital skills are becoming as important as English and Mathematics and will become part of school curriculums in the near future. What amazed me was how quickly the children picked up the basics and took their ideas to the next level. Some children used code language that our senior developers have only just starting to use - we faced a few tricky questions as a result! It just proves that if you introduce computer science early, in a fun and interactive way, it’ll pay dividends in the future - and benefit the local area. Computer science can really become the raw material for change and improvement. I think it would be great to see DVLA as a digital employer of choice in Swansea and some of these children applying for the digital roles we’ll be offering. We’ll be following up on all the feedback - as everyone got a lot out of the event. We’re delighted to be involved in establishing a Code Club in partnership with DVLA. The children are really excited and committed to the Club. They’re enthusiastic about coding and have taken to it readily. Coding looks like it’ll be a vital part of the new curriculum so working with DVLA to develop their skills is a fantastic opportunity. We’re grateful to Karen Stephens (DVLA Code Club volunteer) and DVLA for her time and input – you can see how much fun the children are having. Although this was the first time the agency had held such an event, it won’t be the last. We’ve already got a waiting list of organisations and school leaders keen to see for themselves the benefits of code club and learn more about how they can get involved. A number of schools and organisations signed up with Code Club and Stemnet during the event. Thank you to everyone who helped to make this a success. This is just the start for us and we’ll continue to support the code club initiative and explore how we can work with secondary schools in future.